Did you know that Nirahari bodies develop exceptionally strong nervous systems. Some of us can tirelessly go without sleep for days, while working continously and sipping light juices. Did you know that for a successful Nirahari the utility value of a plate full of his.her favorite food will be similar to the plate bearing the food. The aroma, the memory of the taste no longer controls a Nirahari’s senses. This is the power of breaking patterns. Did you know that Niraharis experience it is easier to assimilate and experientially understand deeper spiritual truths after having broken the body’s dependence on food! Did you know a successful Nirahari’s skin will bear unique shine on it and never look dehydrated even on just 1 cup of water! Did you know that on average humans are advised to drink upto 4 litres of water a day to remain healthy, but a Nirahari can do just as well with 1 cup of water or none just through the power of chanting the Master’s name and remaining in a meditative state despite working all day- AND still have perfectly healthy organs! Did you know that Nirahari’s directly consume energy from space ? A regular person needs to consume food, which is then converted into energy but a Nirahari’s body just skips that part of the process! 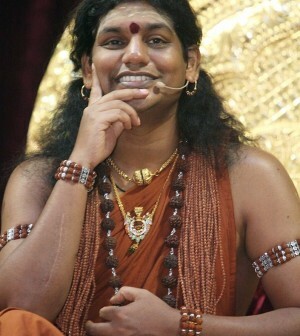 Did you know that Niraharis trained by Paramahamsa Nithyananda become exceptionally creative and compassionate individuals who after seeing their bodies live thus, decide to live the Nirahara lifestyle permanently just to be living examples for people to realise that “Impossible is really I’m possible”. Did you know that Nirahara has proven to be an exceptional cure for Diabetes, hypertension, obesity, any form of addictions and any degree of depression? Did you know that for a Nirahari to be successful he/she should have deep feeling connection and trust in their Master whom they revere as the representation of the Cosmic father/mother ? Based on this , some people find the Nirahara process extremely easy to adopt and follow as a lifestyle versus others. Did you know that contrary to popular belief, to become a Nirahari , all it takes is a half a second tap on the head by the Master during a process called “Initiation/ Energy transfer” and his words “let you all be niraharis” . Back in time, yogis and god men had to practice severe austerities for many years and even lifetimes to live this spiritual science. Now all it takes is an Incarnation’s single look, his word, a click of his finger, a tap of his palm on our heads! Did you know that comparison of ourselves with others creates distance between our bodies and us and that this is the root cause of disease. Niraharis claim that Nirahara programs help bridge that gap. This is why Niraharis will never feel like comparing themselves with anyone- not even for a second! Did you know that the oldest, successful Nirahara participant is 75 years old ?She did not only exist on thin juices and 0 food for 21 days, she also did 1 hour of outdoor yoga twice a day and worked on voluntary assignments for atleast 16 hours a day! Did you know that doing Nirahara Samyama is an amazing cure for women suffering from Polycystic Ovaries? Participants claim total freedom from the need to live on birth control pills, fear of recurring cysts, fibroids,heavy or no bleeding and the need to live on low glycemic index foods. Did you know that Nirahara samyama gets your raging hormones under control, which is why you would suddenly feel you ability to focus, listen , attention span improves drastically. Did you know that Niraharis live with an amazing level of energy? Some times non- Nirahari family members claim living with 1 Nirahari is equal to living with 4 or 5 people! Did you know that Nirahara awakens the non-mechanical parts of the human brain. This is what awakens potential energy lying dormant within a person aka Kundalini Energy. Did you know that even if you do not adopt Nirahara as a lifestyle, just doing the program regulates your eating so well that you will learn to eat when your body needs it, which could be once a day or once in 2 days! Even if you do eat 2 -3 times a day, you won’t be putting on weight since your body’s metabolism will be 300 times more than that of a regular person. Did you know that anti aging and disease free body are just among the most common side effects of living as Niraharis? Did you know that food companies rely on science to understand how you get attracted to food and how they can make their foods attractive to you in a way that you would CRAVE them? Nirahara relies on spiritual science instead, to teach you the exact opposite and thus gain mastery of your body very successfully. Did you know that living the Nirahara lifestyle shows you that the body is not just a bio-mechanism, it is infact pure intelligence meant to experience high levels of super-conscious energy. Did you know that Nirahari’s instill new levels of energy into their personal and interpersonal relationships? Its not just for the good of the body! A Nirahari wife often turns out the tastiest of dishes for her family despite not eating herself. Did you know that Niraharis can start expressing extraordinary powers (siddhis) like manifestation, strong intuition, telepathy,photographic memory, exceptional physical strength etc. Well each Nirahari is unique 🙂 . Did you know that Nirahari’s stop loosing weight after a point and maintain stable weight even while consuming diluted orange juice and water? All it takes is realization that you need to develop deep friendliness with the body and build on the feeling connection(deepl devotion) you enjoy with the Master through en-chanting , unclutching and constantly trying to live the 4 truths of Authenticity,Integrity, Responsibility and Enrichment! Did you know that Nirahara does wonders for the skin? Those with stretch marks say the marks are slowly fading away, skin gets all toned and glowly too. Its like having a personal massage therapist, beauty therapist, fitness trainer built right into the body!